+RIPPER (Chile – Thrash/Death Metal) – Released by renowned labels such as Dark Descent/Unspeakable Axe (US) and Iron Pegasus (GER) this young band went straight to the top of actual South American Thrash/Death scene. Considered one of the best albums of genre in the last years, Experiments of Existence was highly acclaimed worldwide as a gift for any metalhead into aggressive thrash/death metal acts like Sadus, old Sepultura, Sadus and Demolition Hammer. 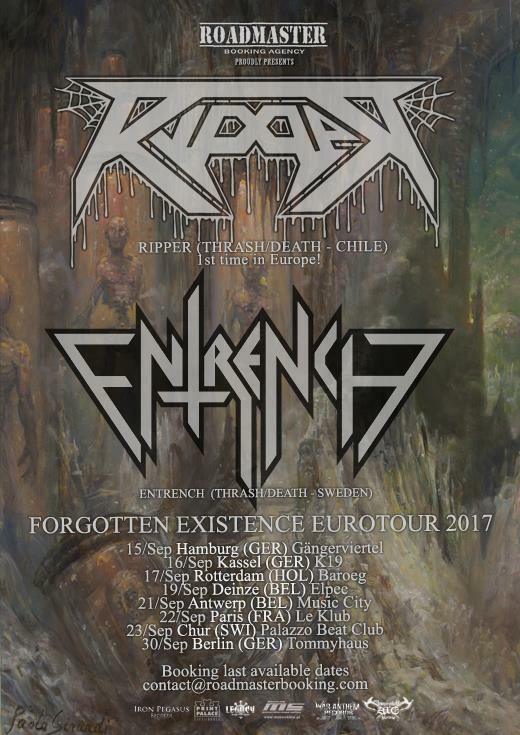 After touring several times over Chile, Ecuador and Bolivia, it’s finally time to show their rage on the European stages! +ENTRENCH (Sweden – Thrash/Death Metal) – Since 2005 they have perfected their brand of ancient thrash/death metal. With two albums out and a third – Through the Walls of Flesh – coming this summer through I Hate Records, Entrench promises to blow the minds of Merciless, Dark Angel and Kreator fans!